Creative Grids Rulers have been a favourite of quilters for a long time and there's good reason for that! Firstly, Creative Grids offer an extensive range of rulers catering for almost every design, block and strip imaginable. See our range below, or click on the links below to skip to each section. Secondly, all Creative Grids rulers have unique "gripper patches" on the back of the ruler, reducing the risk of the ruler moving on the fabric. This ensures improved accuracy for angles and lengths, avoiding frustration for striving for that perfect block. Finally, the markings on the Creative Grids Rulers are embedded within the ruler itself rather than on the surface of the ruler. Through wear and tear from use, your markings will last a lot longer than if the measurement markings were on the rulers surface. 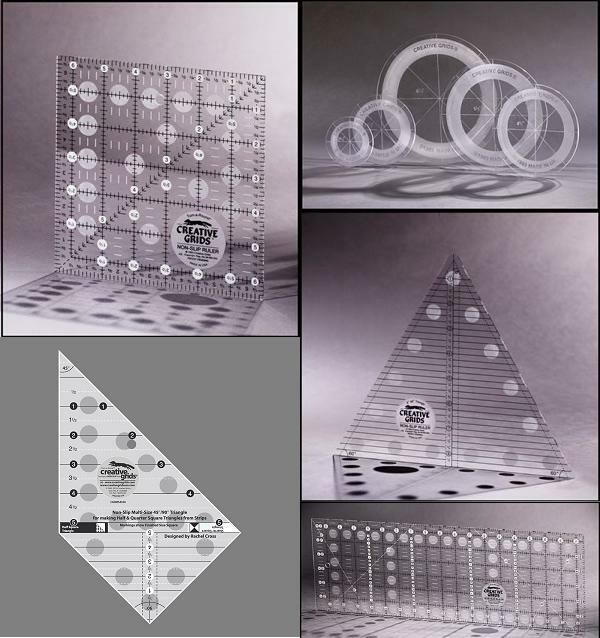 We also have accessories for the Creative Grids rulers, namely the Gypsy Grippers. The Gypsy Grippers can be placed on the top of the ruler to greatly reduce fatigue and make holding the rulers in place so much easier. Not sure if this is the Creative Grids ruler for you? Click here to see a video demonstration. Click on the links below to download a Storyboard and have it printed at your local printers at 100% size. All images are to scale for the rulers.